Sunday Quote!- Sola Scriptura and Reading the Bible | J.W. Wartick -"Always Have a Reason"
Too often, people assume that if we just look at the text, we’ll know what it says. If we just read the words, that’s the meaning. But everyone presupposes a hermeneutical system, and the danger is that if we are not aware of this, we may be using an unreliable one, and our presuppositions will influence us to read the text as meaning something it does not, in fact mean. McGrath shares this and many other insights in this important work. What do you think of this? How important is it to be aware of the way we’re reading the Bible? Microview: “Intellectual Origins of the European Reformation” by Alister McGrath- I reviewed this highly interesting book by Alister McGrath. Be sure to read this as well! 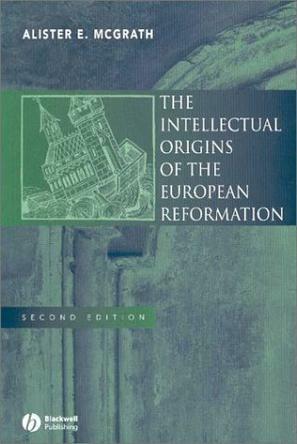 Alister E. McGrath, The Intellectual Origins of the European Reformation (Malden, MA: Wiley-Blackwell, 2003). What is more important? How can you even love someone, without realizing that he/she interprets reality differently from you, whether by a little or by a lot? It strikes me that one of the most evil things you can do, is tell someone that his/her interpretation of reality is 100% wrong. Distorted is ok, but 100% wrong basically is a message to the person that he/she needs to be reprogrammed from the ground-up. Inevitably, the reprogramming will be in someone’s own image, instead of God’s. I wonder how much evil is perpetrated in the world in the form of trying to subversively coerce others to look at reality just like you do, instead of contributing your take on reality and expecting others’ interpretations to aid the enterprise of truth-seeking, or ultimately, to know God better and better. If you cannot intelligibly discuss hermeneutical presuppositions, what is left but shouting or worse, bloodletting? Wayne C. Booth talks about this terrible situation in Modern Dogma and the Rhetoric of Assent. The importance of hermeneutics was one of the major discoveries† of postmodernism; see Richard J. Bernstein’s Beyond Objectivism and Relativism: Science, Hermeneutics, and Praxis, Interpretive Social Science: A Second Look, and Donald E. Polkinghorne’s Narrative Knowing and the Human Sciences, for examples. The last (see the short Google Books preface) is very interesting, as it traces major failures in the theoretical human sciences to be practically useful to the refusal to engage in hermeneutics. † Whether this is truly a discovery or really a rolling back of Enlightenment dogma would be a fun discussion to have. Stephen Toulmin’s Cosmopolis: The Hidden Agenda of Modernity is probably indispensible for investigating the matter.